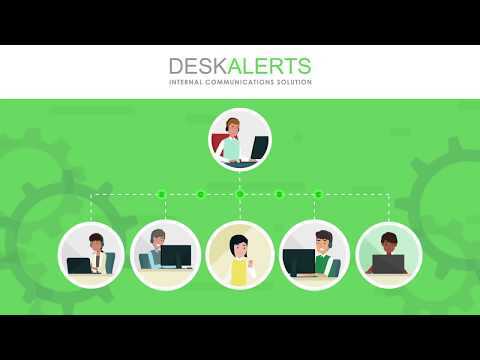 DeskAlerts is an internal communications solution which allows businesses to send alerts to staff via any corporate devices, including PCs, mobile devices, tablets, and more. Businesses can utilize one single platform to send out alerts to over 10,000 users in a matter of seconds, to ensure everyone receives important business announcements and updates. With DeskAlerts, management can send pop-up desktop alerts to employees' screens that block their work until the message has been read. Alerts can also be sent out to employees via mobile push notifications, SMS messages, or emails, meaning alerts will always be received and seen by all employees. The DeskAlerts software automatically tracks and stores alert activity and views with centralized storage that provides instant reporting on user receipt and message views. Businesses can create secure and seamless workflows with DeskAlerts’ integration capabilities with Active Directory, SSO, and API integrations. When there is any sudden issue or critical situation, users with the relevant permissions can instantly notify all employees or specific departments. DeskAlerts allows users to utilize one interface to directly send a newsletter or announcements about important company events to employees' desktops or mobile devices. These messages can’t be skipped, ignored or minimized and will even appear on screens that are locked, on standby or on screensaver mode. DeskAlerts has been useful for me in sending IT messages about scheduled shutdowns or technical difficulties. This has been better than using email since our email software has been experiencing bugs, so DeskAlerts makes it so that people can see the alerts even with other technical problems. I liked that I did not have to rely on an email system and the variety of different options for who to send messages to. I liked that I did not have to rely on an email system and the variety of different options for who to send messages to. Only thing is that the company has had trouble moving to outside alerts for those outside the company but that hasn't been within my scope. Very easy to install and configure. Easy to use to send alerts. API works great to automate with scripts or security systems. A few bugs here and there but they update often so you usually won't be dealing with them for long. DeskAlerts is available in a range of different pricing packages. Contact DeskAlerts for more information and to get a pricing quote. • DeskAlerts allows users to send messages straight to employees' computer desktops and mobile devices in the form of pop-up notifications that can't be skipped or ignored. • DeskAlerts helps to free up the time of IT departments by keeping all staff informed about IT issues. It prevents misunderstandings and aims to reduce the number of incoming calls that arise as a result. • DeskAlerts allows users to send scheduled messages that cannot be missed or ignored about upcoming IT events, so all employees are guaranteed to be in the know and reduce the number of random failures of expensive and time-consuming IT operations. • With the quick surveys functionality, HR specialists can receive timely feedback, and the desktop alerts can bypass email overload and help employees find out the most important news in a timely manner. • Users can integrate DeskAlerts with third party systems for single sign on (SSO), ERM, helpdesk, call center management, and more, as well as Active Directory and the DeskAlerts API. Below are some frequently asked questions for DeskAlerts. Q. What type of pricing plans does DeskAlerts offer? Q. Who are the typical users of DeskAlerts? Q. What languages does DeskAlerts support? Q. Does DeskAlerts support mobile devices? Q. Does DeskAlerts offer an API? No, DeskAlerts does not have an API available. Q. What other apps does DeskAlerts integrate with? Q. What level of support does DeskAlerts offer?